One time at my grandma’s place I saw old nylon pantyhose. My grandma told me that she has even more interesting items took out a bag of old clothes from the attic. It was full of various stockings, old pantyhose, socks, leg warmers, and spatterdashes. "These are the ancestors of today’s pantyhose" Р“СћРІвЂљВ¬РІР‚Сљ said grandma Р“СћРІвЂљВ¬РІР‚Сљ "Look." Grandma showed me her old leg warmers that her mom wore to work. During that time buildings didn’t have proper heating and in order not to catch a cold she wore shorts, legwarmers, and socks. In the 50’s the items that saved her from the cold were spatterdashes, warm socks, and rubber boots. In addition to that great grandma wore stockings. They came in different colours Р“СћРІвЂљВ¬РІР‚Сљ beige, black, grey, brown. Even though stockings were not warm, but they looked very fancy. "Now, these are already my own stockings" Р“СћРІвЂљВ¬РІР‚Сљ said grandma Р“СћРІвЂљВ¬РІР‚Сљ "Р“СћРІвЂљВ¬¦ they have a patterned knit from wool yarn. And, here, these ones are machine knit from cotton yarn. And these other ones are made of silk. Such stockings were worn under long knickers and they would hold up on the legs thanks to the round elastic bands , 2 Р“СћРІвЂљВ¬РІР‚Сљ 3 cm wide. Later we acquired stockings made of dederon (a trade mark for polyester yarn) and such stockings would attach to a garter belt. Such stockings were comfortable and pretty." 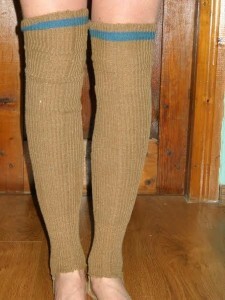 My grandma wore such dederon stockings for about 3 to 4 decades and she shared a funny story with me from her youth. When she was in high school, she would run away with the other girls between classes to a discount store to buy such stockings at lower prices. Once they didn’t return in time and were late for their chemistry class. For they had to go in front of the school committee and write a note explaining where they were for half of the lesson. "Later nylon pantyhose appeared" Р“СћРІвЂљВ¬РІР‚Сљ grandma continued Р“СћРІвЂљВ¬РІР‚Сљ "They were not durable and not comfortable. Those pantyhose were replaced by a type with a panel between the thighs and they were much more comfortable. Now for plus size women there are pantyhose with an extra panel of fabric in the front and at the back and they are so elastic. Depending on the season, there are warm styles and lace fishnet styles." In those times men didn’t notice women in pantyhose as much as in today’s time. Stockings and pantyhose were just common items in a women’s wardrobe. Today men tend to gather around women in nice pantyhose. There is an unexplained force that in public places attracts men to the wearers of pretty pantyhose. Men, enchanted by the beauty of women’s legs in pantyhose, will not necessarily sit or stand near the one with nice legs in pantyhose, but will choose a spot from where that woman can be seen well.